Get more fun out of your day with a phone that offers you long battery life, smooth power and gorgeous visuals on a big IPS HD screen. 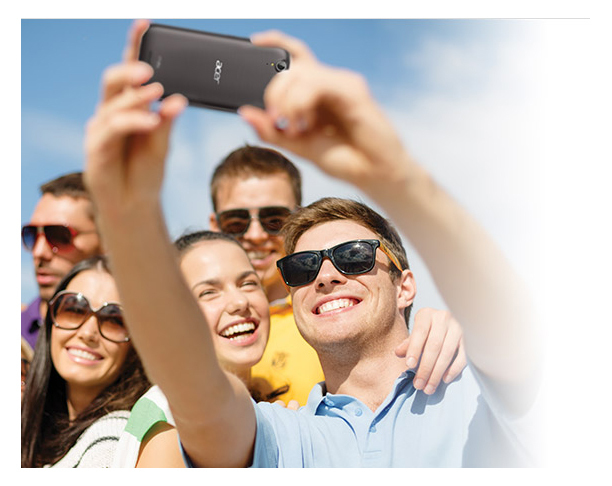 Just say "cheese" and the 8MP front-facing camera takes a wide-angle selfie, no sweat! The 5.5" HD screen is powered by an impressive 64-bit quad-core processor that delivers quick reactions as well as smooth browsing, video-streaming and gaming. A 4000 mAh battery delivers more than enough power to keep you going all day. Impress your friends with a phone that takes beautiful wide-angle selfies when you simply say "cheese". The 8MP selfies will stand out amazingly on the IPS screen, which lets you see images perfectly from any angle. Be a star when you offer to charge your friends’ phones with your phone – via the Micro USB charging port. This port can also be used to plug in a USB flash drive – for playing media, downloading files, or saving and sharing stuff. 2. Requires a Micro USB OTG (On-The-Go) adapter. 3. For USB drives that feature Micro USB connectors. A normal USB connector will require a USB-to-Micro-USB OTG (On-The-Go) adapter. Data-transfer support for FAT32 format – i.e. for storage sizes up to 32GB.